Location: Taunton Livestock Centre, Priory Bridge Road,Taunton,Somerset TA1 1PN. A joint Production Sale from the Longash, Tripps and Holcombe herds is being held at Taunton Market. Further entries from other herds welcomed. Entries close Friday 15th September 2006. This sale is being co-ordinated by Taunton Market Auctioneers. Clive Roads, in the capacity of LCS Official Auctioneer, will be in the rostrum. Catalogues are now available from the Auctioneers. The Long Ash Herd of S.A. Hollier Esq. The Holcombe Herd of I.K. Clark Esq. The Warns Herd opf N.R. Glover Esq. The Oxlane Herd of D. Nutt Esq. The Three Bridges Herd of R.J. Sheppy & Son. The inaugural sale of the Mid West Longhorn Breeders Group at Taunton saw 92 Longhorns forward with significant contingents from Sid Hollier and from David and Pat Lawrence. A packed Sale Room following the busy Saturday market at Taunton saw a welcome and significant number of new purchasers. Top price of the day, 2000 guineas, went to English Nature's bull, Stoke Eric, a prominent winner in the show ring who now goes to Cornwall. Sid Hollier's bull, Culcombe Elite, bred by J. D. Wilson, made 1800 guineas. 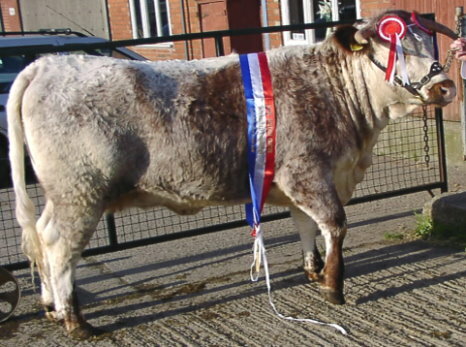 The top price female was also bred by English Nature, although sold from David Sheppy's herd at Taunton. The cow, Stoke Brandy, made 1450 guineas. The top priced Senior Heifer at 1100 guineas was Sid Hollier's Long Ash Emma by Quantock Tempest. The top priced Junior Heifer was David Hitching's Ashton Freeze who made 720 guineas and sold to David Sheppy. Location: Horsley Lodge Golf Club, Horsley, Derbyshire DE21 5BL. Click here for Golf Club and Restaurant website. Rita Poulson, New House Grange, Orton Lane, Sheepy Magna, Atherstone, Warwickshire CV9 3NJ. Please send cheques made payable to Midland Longhorn Breeders Club to Rita at the above address as soon as possible. Donations of prizes for the Raffle will be much appreciated on the day. We look forward to seeing everyone at the Annual Presentation Lunch. Judge: Ron Hodgkinson, Lutterworth, Leicestershire. during the 2006 Show Season at a maximum of 10 shows.